With a smug sense of mutual righteousness, the car was set in motion and we headed east on Route 224 through Poland to just outside New Castle, Pa.
Palate, nestled in the corner of the unassuming Westgate Plaza, opened in May 2017 by the restaurant’s co-owner and chef, Sam Michael. Michael, a native of Philadelphia, worked in his parents’ bakery and pizza shop as a young man. He moved to the area in 2005 to be closer to family. He’s worked in several area restaurants and did a stint recently as a butcher at Palumbo’s Meat Market in West Middlesex, Pa. In late 2016, a six-month renovation of the restaurant was started. The decor is somewhat rustic, but comfortable with handmade tables, reclaimed-wood paneled walls and a chalkboard menu. “I want Palate to be known for offering affordable quality local products,” says Michael. Palate has a regular menu but also has a specials board that changes frequently. We first sampled two appetizers, fried Brussels sprouts and vegan avocado tacos. For the sprouts, Chef Michael cuts them in half and deep-fries them. They are mixed with housemade bacon and shaved parmesan cheese and served with a housemade lemon aioli. By frying them, they become slightly charred and crispy on the outside but tender on the inside. The bacon and the cheese make them perfectly salty, and the brightness of the aioli is the perfect complement. An addictive app. From past columns, it is clear that we both are far from vegan. However, the vegan avocado tacos were delicious. Panko-crusted wedges of avocado are deep-fried and served in a flour tortilla with citrus slaw, fresh pico de gallo and a cilantro jalapeno vegan mayo. The avocado provided a crunchy fried flavor that everyone loves, the slaw provided citrus and the creamy mayo finished the dish off perfectly. A wonderful plate. The Yelp reviews on Palate rave about the burgers and fries, and after trying them ourselves, we can see why. 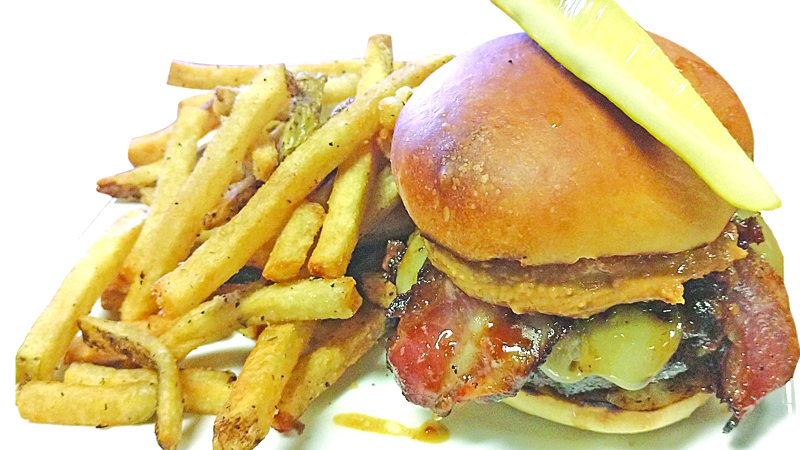 Chef Michael uses local grass-fed beef, makes the brioche buns in house and smokes his own bacon. You have the option to build your own burger or try one of the few specialty ones he has on the chalkboard. On our visit, there were two on the board, and they were both outstanding. First up was the Hoisin Bae burger. With this version, the burger is topped with house-smoked hoisin-glazed pork, pickled onions, cilantro, a fried egg and sriracha mayo. The meat itself was cooked perfectly, juicy and seasoned nicely. There was sweetness from the pork, tanginess from the onions, creaminess from the runny egg and just a little spice from the sriracha. It was bursting with a lot of different flavors but they all worked well together. Secondly, we had the PB&J burger. This time, the patty is topped with housemade bacon jam and strips of bacon, white cheddar and creamy natural peanut butter. Some people will read this and say, “Peanut butter on a burger can’t possibly be good,” Wrong. The salty bacon and the creamy peanut butter are a perfect marriage. Plus, how could bacon strips and bacon jam together ever be bad? This was shockingly good and highly recommended. In most sandwich entrees, the fries are an afterthought. Not at Palate. Chef Michael fries the fresh-cut potatoes at a lower temperature first, then they get a second dip at a higher one. This creates the crispy exterior while keeping the spuds moist on the inside. Our favorite things about them was that he seasons them with salt as well as a generous amount of pepper. Very tasty. While it’s hard not to fall in love with the burgers, Chef Michael explained that he usually has four or five entrees on the specials menu. Today, we were fortunate enough to sample a few of them. We started off with a wonderful scallop dish. Growing up in Philadelphia, Michael has always loved seafood and tries to get it in fresh as often as possible. Nicely crusted pan-seared U-10 scallops were served over acorn squash puree and sauteed local kale, then topped with a bacon maple Kahlua demi-glace. This dish had subtle flavors that didn’t overpower the delicious scallops. The kale was tender and the puree a little sweet. A solid offering. Next was a spin on Chicken Marsala. Chef Michael grills the chicken breast instead of sauteing them, which gives the dish a different flavor. The chicken is served over garlic and black-pepper risotto and topped with locally harvested chanterelle mushrooms sauteed with bacon, wilted spinach and a sauce of Marsala wine, butter and sherry. The char from the grilled chicken was a nice addition to the savory dish. This dish was balanced nicely and was both comforting and flavorful. As we do most times, we ended our meal with something sweet: peaches and cream. Housemade poundcake was topped with grilled local peaches and served with a wonderful sauce made with sour cream, bourbon and maple syrup. Our favorite part of this dish is that it wasn’t too sweet. A nice ending to a truly superb dining experience. Palate delivers on the goal of presenting scratch-made offerings, using local ingredients in a fairly priced manner. The art in artisan cuisine is something worth tasting. WHERE: Palate, 2038 W. State St., New Castle, Pa. HOURS: Monday to Thursday: 11 a.m. to 9 p.m.; Friday and Saturday: 11 a.m. to 10 p.m.